Tapping combos multiply the player's BPC by the current combo stage. To reach the first combo stage (x2), the player has to keep tapping on the main screen for 5 seconds. Higher stages are reached by continuous tapping until the counter fills up with red. If the player lets the red line fall to the bottom of the counter, he will have to start over again. To enable tapping combos, the player has to purchase the relevant Gene Strand upgrade. The first upgrade is unlocked after destroying two planets and enables combos up to Stage 3. 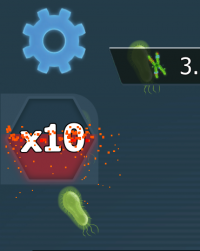 The maximum possible combo counter is x20 and it is unlocked by researching Particle Accelerator in the Dark Matter Institute. This page was last edited on 6 July 2018, at 11:25.